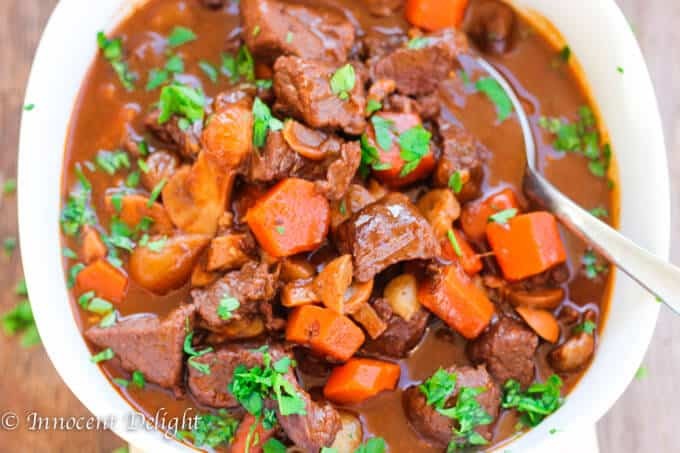 What screams “comfort food” more than a beef stew that’s been simmering for hours and filling your home with an incredible aroma? For me, this is a perfect Sunday meal. 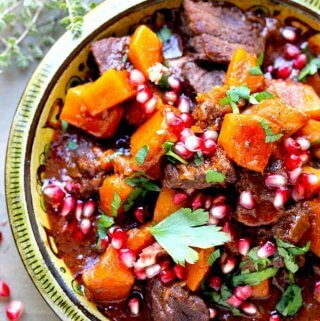 The addition of warm, wintery spices, a sweet delicious squash and pomegranate, makes this Butternut Squash Beef Stew a real cold weather treat. While I was working on this Ultimate Guide to Most Popular Winter Squashes, my husband brought up a good point (as he frequently does). He said that I needed to incorporate more dishes with winter squashes. Naturally, he was right. I had all these beautiful squashes at home and needed to come up with creative ways to use them. 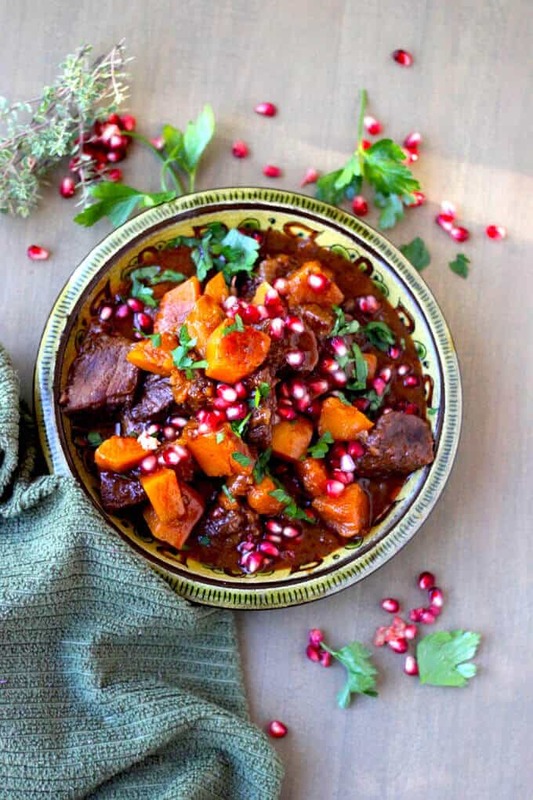 So, when brainstorming a dish, I thought that beef stew might pair well with a butternut squash…and, as this post testifies, I was right. 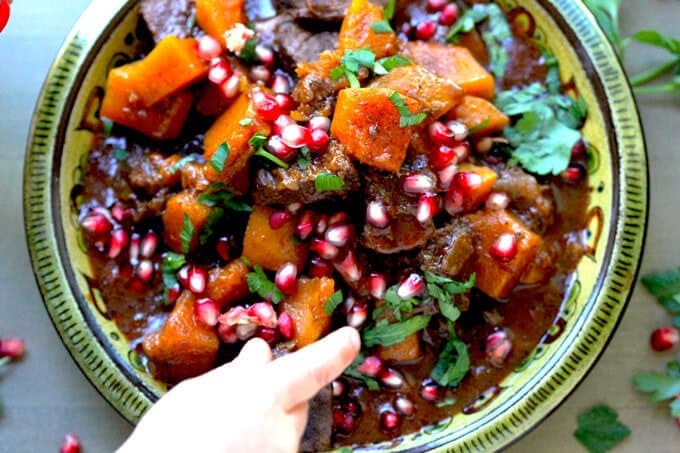 This butternut squash beef stew came out amazing! I served it for dinner when we had a guest in our house. She was amazed. She said it tasted incredible; but she wasn’t really able to figure out what made it so unique. Then I told her – it was a cinnamon. Believe me, if you want to elevate a savory dish to another level, just add some cinnamon. Not only it is a super healthy, warming spice – perfect for cold wintery days, but it’s also super delicious. 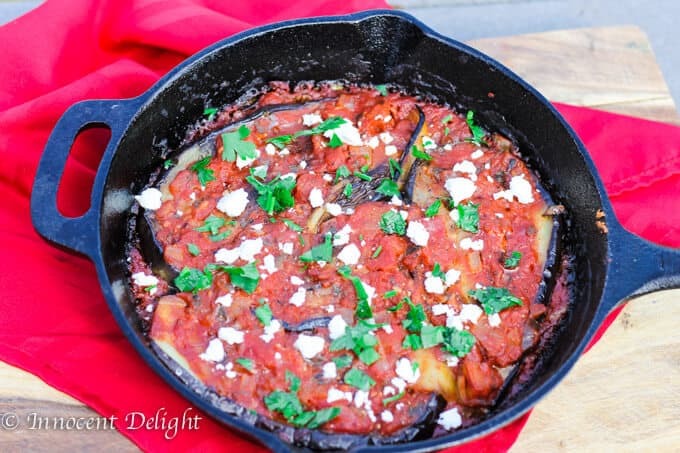 I also used it in these recipes and they all are outstanding in their own right: Moroccan Spiced Beef Stew, Turkish Inspired Eggplant with Tomatoes, Greek Chicken with Cauliflower and Tomatoes. 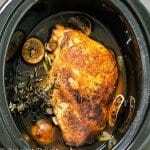 As you can see, I used cinnamon in all the recipes that are inspired by tastes from Mediterranean countries. 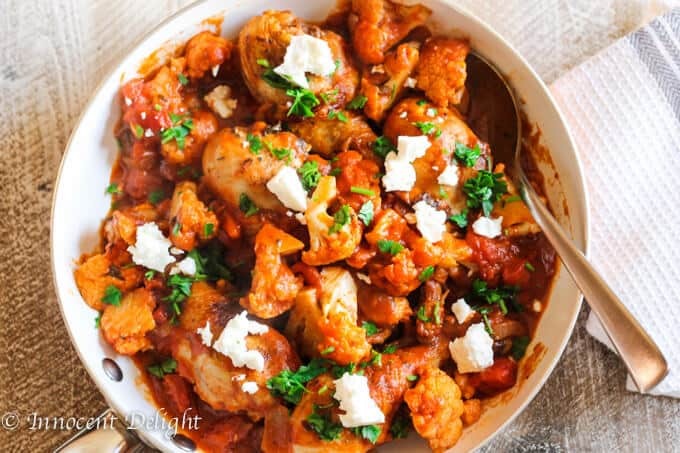 That’s right, cinnamon is widely used in Mediterranean cuisine. I can assure you, people from around Mediterranean Sea know what they’re doing. 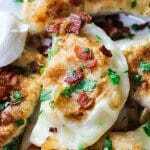 Not only are their cuisines one of the healthiest in the world, but also incredible delicious. I love adding cinnamon to my savory dishes. I work full-time, so for me the weekends mean that I have to think about dinner for the rest of the week. Normally on Sundays I would cook something that we can have for one more night during the week. It saves some time after we get home from our busy days. 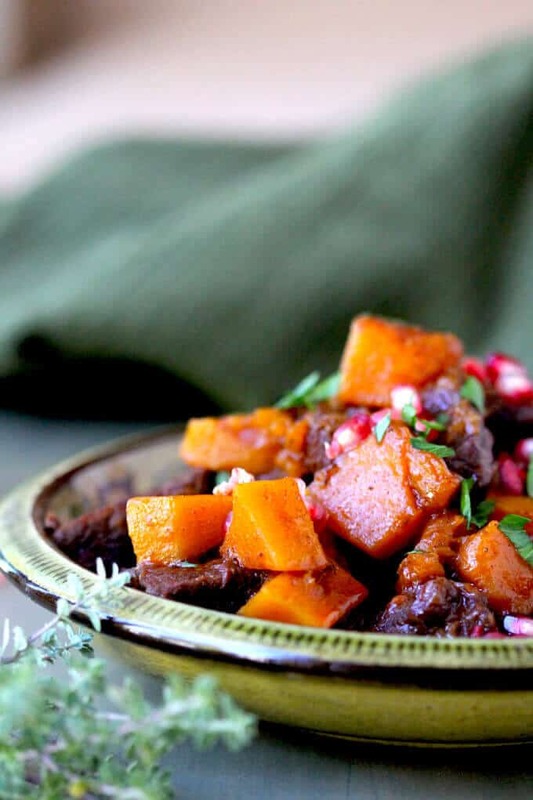 This butternut squash beef stew is a perfect ‘leftovers’ dish too. 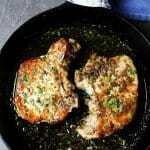 You just put it back into the pan and heat up slowly. Serve it with mashed potatoes or this Potato Leek Casserole and you are going to be a star in your house. Btw, I had a little 3-year old helper with this photoshoot. 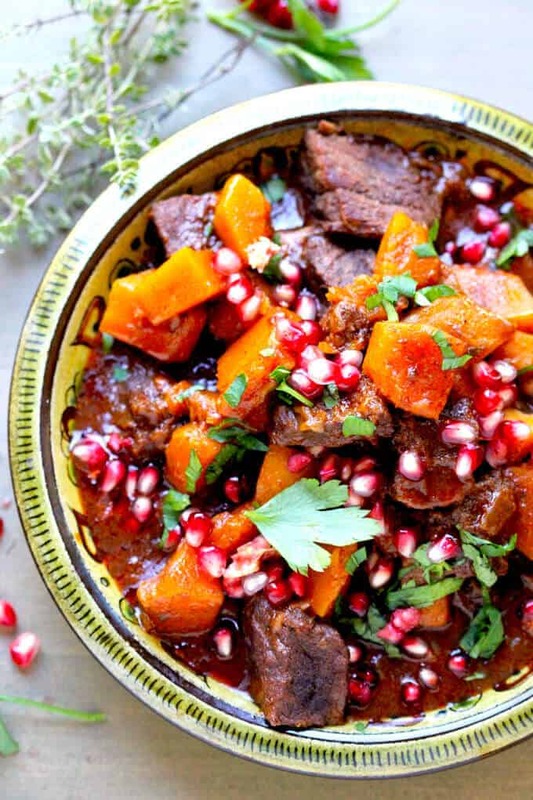 with cinnamon and pomegranates…. YUM! You’ve taken this stew in a completely new direction and I love it! It’s really good! Cinnamon makes everything taste better! 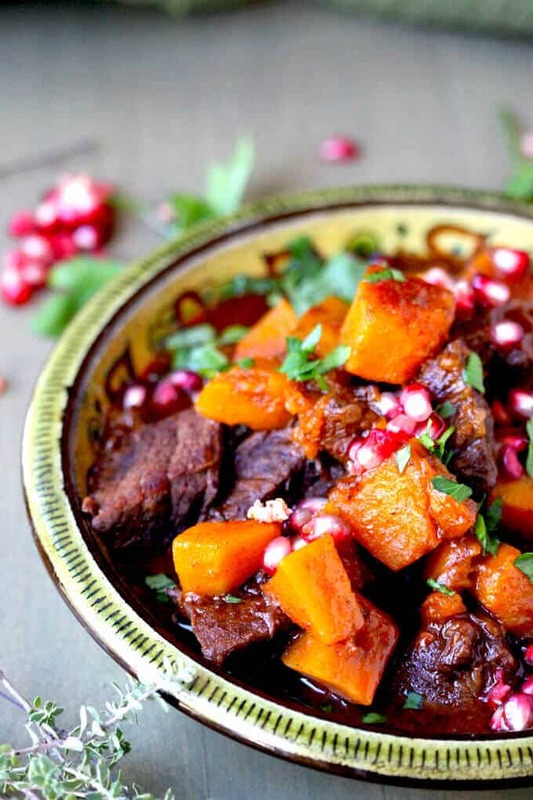 Wow – I’m loving all the flavors and heartiness in this stew. And it’s so vibrant! Thanks Lisa. It is super delicious! oh yes, stew is such a great comfort food. I love all these flavors in this stew. It’s a great spin on an old favorite.